Do you want to know how well your WordPress forms are converting overall, or which specific contact form drives the most conversions? Then you’ll need to set up conversion tracking for your WordPress forms. With form conversion tracking, you can track form views, submissions, and conversion rates. Let’s take a look at 3 different types of conversion tracking for your forms, and how to set each of them up on your website. When a visitor fills out a form on your site, they’re taking the next step in their customer journey. By tracking form conversions, you can analyze what works best for converting your visitors into leads. By default, Google Analytics doesn’t allow you to track conversions for your online forms. Enabling form conversions manually can be tedious and time consuming. With MonsterInsights, you can easily track form submissions as events without having you to touch a single line of code. 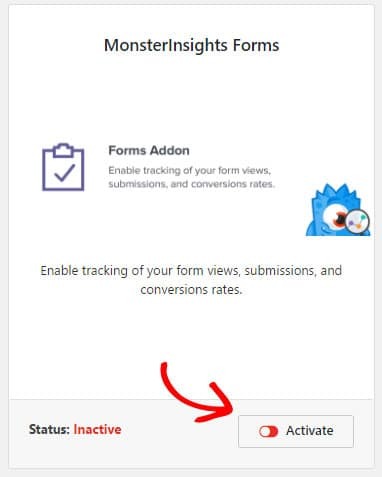 All you have to do is install and activate the MonsterInsights Forms addon, no settings or additional configuration required. It works right out of the box. No thank you page or goal setup required: You don’t have to set up a thank you page or a conversion goal for tracking form submissions. Track all your forms out of the box: Just activate the addon once and all the forms you create on your site will be automatically tracked in your Google Analytics account without any further steps. Supports your favorite contact form plugins: It works seamlessly with any WordPress forms plugin, including WPForms, Gravity Forms, etc. In-depth insights: Determine how your forms perform by analyzing form impressions and conversions. 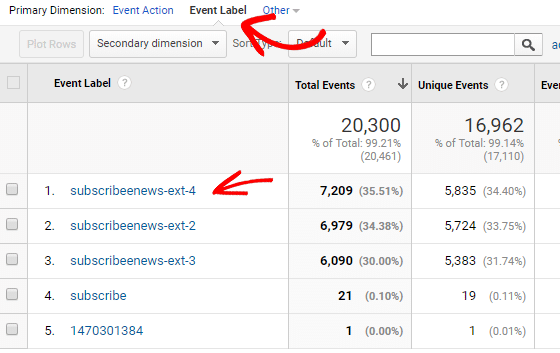 Event tracking: You can enable event tracking in Google Analytics for form submissions. The first thing you’ll need to do is to install the MonsterInsights plugin and connect it with Google Analytics. 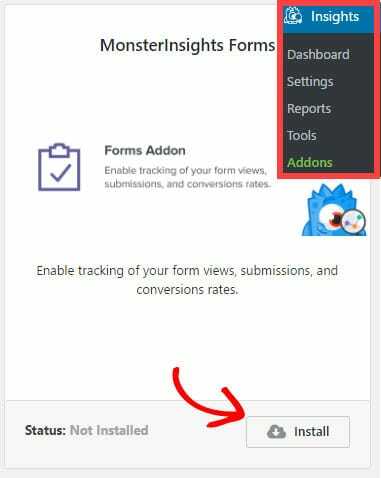 Then go to Insights » Addons and click Install under the MonsterInsights Forms addon. You’ve successfully installed the Forms addon. No further configuration is required. Now you can see your form conversion data right in your WordPress dashboard. Navigate to Insights » Reports and click on the Forms tab to see the reports. 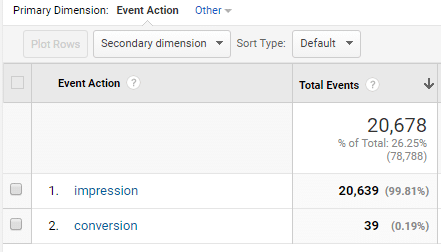 In the report, you’ll see the total number of impressions and conversions for each of your WordPress forms. You can also view the conversion rate in percentages. Using this method, MonsterInsights makes forms tracking setup, as well as viewing reports, super easy for WordPress users. 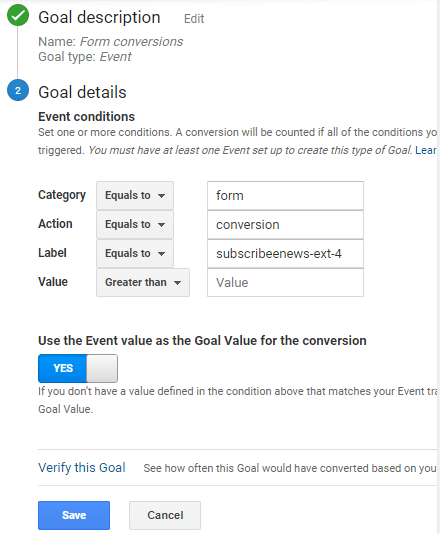 While you can easily track form submissions as events without having to create a goal, sometimes you might need to set up a goal for conversion tracking; like when you split test your conversions with Google Optimize. The primary benefit of tracking form conversions by setting up an event goal is that you don’t have to create a thank you page for tracking. 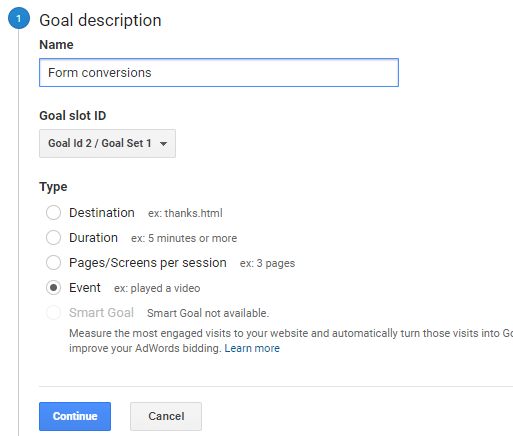 Sign into your Google Analytics account and select the website for which you’d like to create a new goal. In the left-hand panel, click Admin. Then, in the View column, click Goals. To create a new goal, click the +New Goal button. Now you’ll be prompted to enter a description and details for your goal. Choose Event as the goal type. Then click Continue. In this step, you’ll have to specify the event goal’s details. 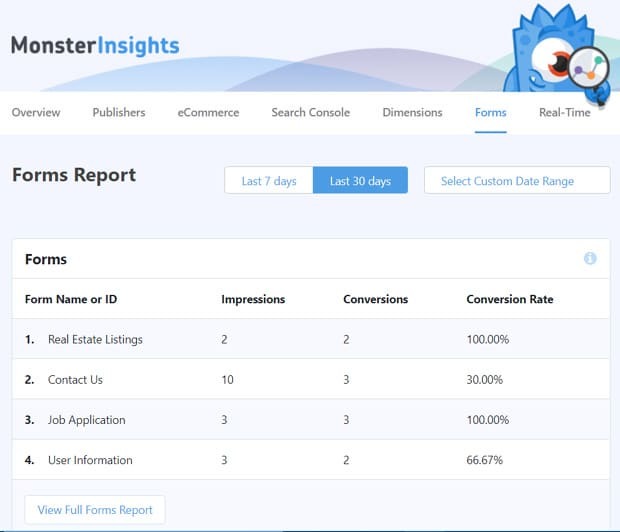 By default, the category and action are specified as form and conversion respectively when you use MonsterInsights to track conversions for any form. Only the Label field will change for tracking conversions of different forms. You can also provide an integral value for this goal if you want to. To determine the Event Label, visit the page where your WordPress form is located. 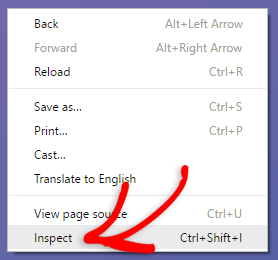 Then right click your form and select Inspect. You can now find the form id, as shown in the screenshot below. 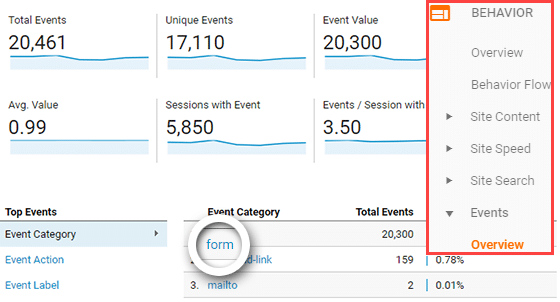 MonsterInsights uses the form id as an Event Label in your Google Analytics. To verify, head over to Behavior » Events » Overview. Click form. 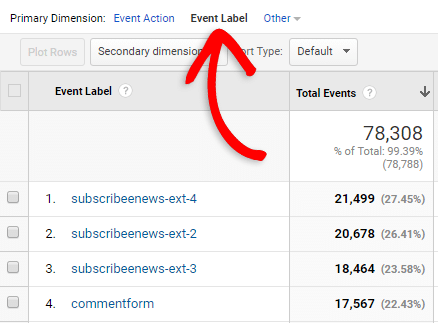 Next, choose Event Label as your primary dimension. Verify whether you can find the form id in your Event Label list. 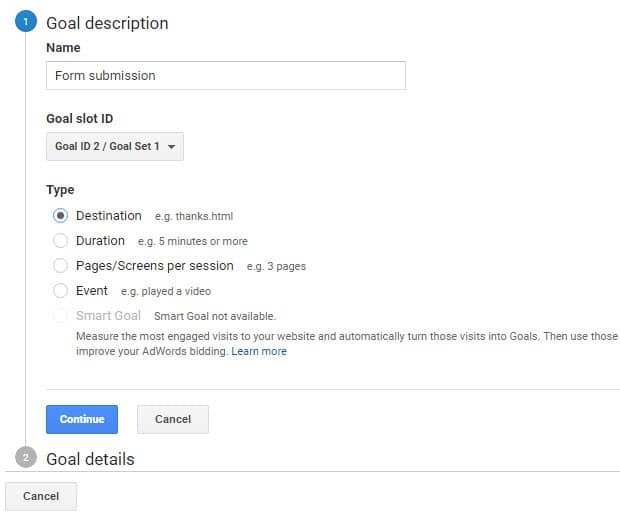 Then go back to your goal set up page and specify it in the Label field. Finally, click Save. You’ve now successfully set up an event goal for form tracking. Tracking form conversion using the destination goal type is probably the most common method to track conversions. When you’re tracking your form conversions this way, you’ll have to create a thank you page. 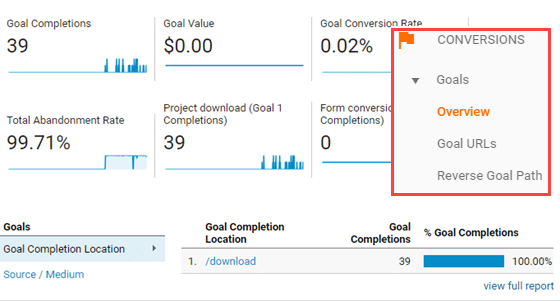 For a step-by-step guide on setting up a goal this way, read how to create a goal in Google Analytics to track conversions. It may take some time (usually 24-48 hours) for Google Analytics to start gathering data on your form views and conversions. 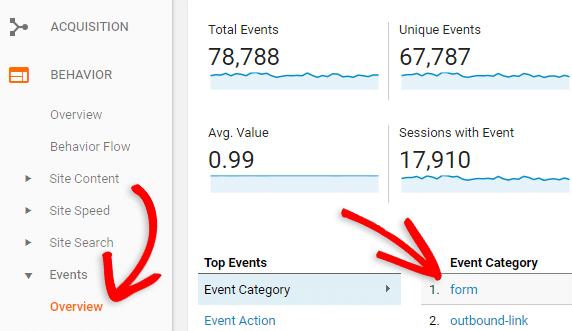 Once it does, you can view them by logging into Google Analytics and clicking on Behavior » Events » Overview and then clicking on form on the right. Then you can click on Event Label to see separate stats for each form on your site. Navigate to your goals overview report by visiting Conversions » Goals » Overview to find your form conversion goals. That’s it! 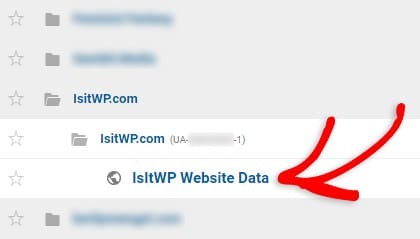 Now you know how to track your WordPress form conversions in Google Analytics. If you enjoyed this article, you might also like to know how to discover where your email subscribers are coming from. second comment waiting for answer. Does this work with jotform embedded forms ?